Answer to Mystery Photos (1&2). 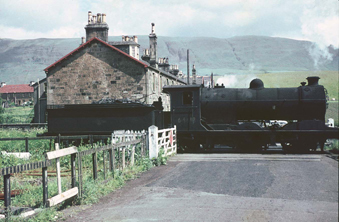 I put in days and days of research to try and find out just where these two pictures were, including following just about every possible Scottish railway on Google Earth. Also, at all the film shows I gave I showed them in the hope that someone would recognise the location - it seemed to be such a distinctive place. 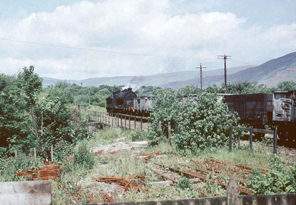 The answer eventually came via a show for the Festiniog Railway Society in Cheltenham where someone said he had a friend who was knowledgeable on Scottish railways. It is Rowantree Terrace, Lennoxtown and amazingly the person concerned - George Brown - used to live only a few miles away at Milton of Campsie. My downfall, as such, was that it never occurred to me that the entire row of houses had all been demolished - which is why I couldn't find them on Google Earth! George Brown sent this Google Earth link that if you click here will show you the location today. In the 3D version of Google Earth you can even achieve the same perspective as the original photos with the hills rising up in the background! Many thanks to George Brown for his help. Website design by ReZolve. An SSIDM website - v2.9.008c . Loaded in 0.0234 seconds.